Yahoo continues its rebranding campaign dubbed “It Starts with Y!ou” by adding some more bling blings to the Yahoo Messenger client. Now with new audibles and avatars, YM extends Yahoo’s “Yodelling” campaign which started with the Yodel Studio. The YM audibles include reggae, bluegrass, hip-hop, a capella and R&B beat. If you’re using Yahoo Messenger versions 8.1, 9.0 and 10, you can start using these audibles by clicking on the Audibles icon in your YM window, then click More Audibles -> See All Audibles -> Yahoo Yodels. 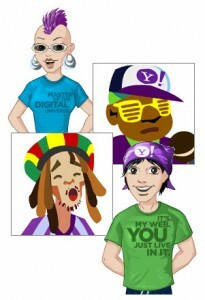 Aside from Audibles, Yahoo also brought out new way of dressing up your YM Avatars with new T-shirts and campaign slogans such as the ones that reads – “It’s my Web, you just live in it” and “Master of the Digital Universe. To change your Avatars’ T-shirt just go to Yahoo Avatars -> Branded Tab -> Yahoo. Now here’s the coolest thing, you can now order those cool Yahoo T-Shirts from the company’s store. The Tees look pretty cool. In fact I just ordered one for myself and one for my 6 months old son. Now, if only Google will have those similar branding merchandises, then that would be cooler. my speaker is not active how can i do.it…? yeu mot nguoi nung nguoi do lai yeu mot nguoi khac trong thoi gian dang wen nhau. ngay co ay mun dut khoat voi nguoi kia cung la ngay moi thu bi phanh phui. co ay mun quay ve voi toi. toi nen tha thu hay ra di.